Manchester United chief executive David Gill has admitted the club are still hopeful of making one more signing during the summer transfer window. United manager Sir Alex Ferguson said on Monday he was unlikely to sign anyone before his side face Manchester City in the Community Shield. And while Gill said no negotiations are currently ongoing, he did reveal their summer recruitment may not be over. "We are looking at one more player to bring in," Gill told MUTV. "Nothing is happening and nothing is imminent but we will see what happens when we get home. "There will still be 31 days of the transfer window to see if anything develops. "The important point to understand, and Alex has made clear, is that we need someone who is going to improve the quality of the squad. "We have a great squad and to get into that squad you need to be a world class player. "If you can't get the players you want, there is no point buying someone for the sake of it. But you never know, there is often movement in August. "I am not saying I am working on anything specific because I'm not. But that situation could change quickly when we get back to Carrington." The Premier League champions, who are on a three-week tour of the United States, have already brought in winger Ashley Young from Aston Villa, Blackburn's Phil Jones and goalkeeper David de Gea from Spanish side Atletico Madrid. Inter Milan midfielder Wesley Sneijder has also been heavily linked with the club. 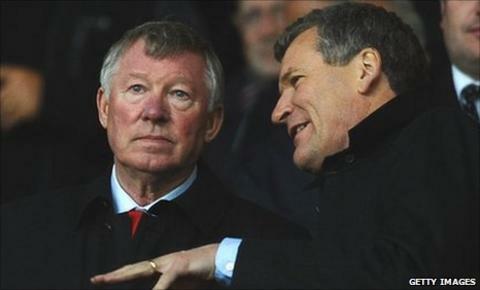 But Ferguson said on Monday: "At this moment, I can't see another addition. The type of player we might have been looking for is not available." And speaking ahead of Wednesday night's match against the MLS All-Stars, he added: "We lost five players in their 30s this summer. The retirement of midfielder Paul Scholes, in particular, lead to Manchester United being linked with playmakers Sneijder, Arsenal's Samir Nasri and Luka Modric of Tottenham. Ferguson, though, has distanced himself from a move for Sneijder, saying he "had no real interest". "Scholes was such a great, consistent player for us. I don't think we will find another Paul Scholes," said the Scot. "But hopefully we can replace him. Maybe we will find a different type of player. Manchester United do that. Ferguson is therefore preparing with the squad he has now for a Community Shield with a difference on 7 August as it pitches United against their Manchester rivals, who won the FA Cup last term to end a 35-year trophy drought. "It is not a normal Community Shield for Manchester United," said Ferguson. "It is addressing our noisy neighbours again. It will be an interesting match."